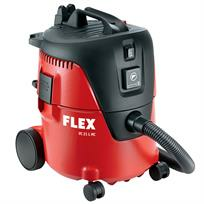 The FLEX VC 21 L MC Safety Vacuum Cleaner is a compact vacuum cleaner that is simple to use and very easy to move around. It is ideal for cleaning vehicle interiors and automotive workshops, and comes supplied with an extensive range of suction tubes and attachments ideally suited to these tasks. The FLEX VC 21 L MC Safety Vacuum Cleaner features a powerful turbine that produces a strong vacuum (for dry use) and a high suction capacity (for wet use). It also features a level monitor with a built-in float valve, a power socket for additional tools and a manual filter cleaning function. The impact resistant body of the FLEX VC 21 L MC Safety Vacuum Cleaner is equipped with smooth running wheels and swivel castors, a clip-on cable hook and built-in holders for suction tubes and attachments.